CipherTrace, a U.S.-based cybersecurity firm, has published its inaugural cryptocurrency Anti-Money Laundering Report. Some of the major hacks/thefts that shook the cryptocurrency ecosystem this year were the ones suffered by Coincheck, Bithumb, Coinsecure, and Coinrail. In Q1 and Q2 combined, cryptocurrency exchanges lost $761 million to theft, as compared to $266 lost in 2017, Reuters noted referring to the report. CipherTrace estimates this figure could surge to $1.5 billion this year. 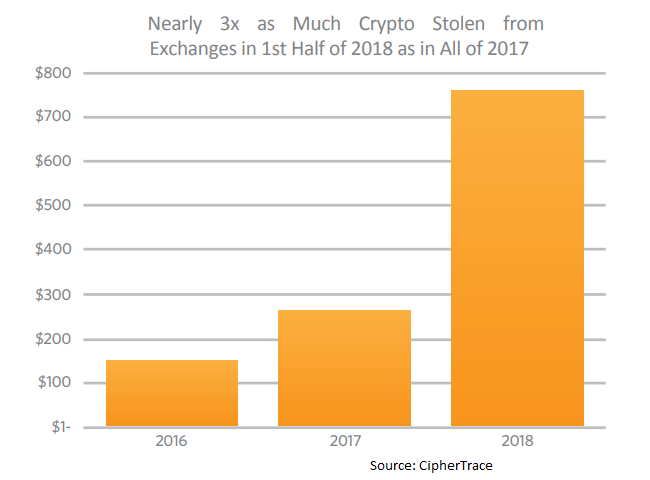 “Stolen cryptocurrencies are three times bigger this year than last year so the trend is obviously not our friend here,” Dave Jevans, chief executive officer of CipherTrace, told Reuters. The report also noted the rise in the number of money laundering services available for cryptocurrencies, also known as mixers, tumblers, foggers and laundries. CipherTrace is launching a software that will enable exchanges and hedge funds using or trading cryptocurrencies to ensure compliance with anti-money laundering laws. Jevans said that global regulatory authorities, law enforcement, and exchanges have been in continuous talks to explore how to prevent cryptocurrency-based crime. “Now we are seeing the big guys coming together asking for cryptocurrency anti-money laundering regulation - it is inevitable, it will be unified, and it will be global,” he added.